Most of the women leaders that I coach are working the high wire between their current position and being promoted to high impact senior executive. Because I've had this "in the trenches" view I understand how difficult it is for women to thrive in the man's world of business leadership. It's not men's fault that business organizations are designed around typical male strengths of competitiveness rather than typical female strengths of collaboration... it just is. Recently, I was asked to interview and onboard Julie, the new chief marketing officer for a multibillion-dollar cellular wireless company. Her colleagues on the executive leadership team were all meat-eating males. Their backgrounds were finance, operations, technology, legal, and engineering. I explained to her that the leadership team operated primarily on hard power. Goal focus, driving results, and relentless accountability are key hard power behaviors. Of course, Julie was hired because she had well-developed soft power skills... customer empathy, value innovation and a proven ability to collaborate to achieve failure-proof execution. Now I've noticed the natural tendency that whenever women start to feel a loss of power around men they often try to act more like men. They speak louder, are often more insistent, and frequently cuss to become one of the boys. This is a fatal mistake. produce better business results including growth and profitability than one-gender teams. So when the strengths of both men and women are harnessed results better. The problem for many women is that the language and culture of business reflects the orientation of male brains rather than the strengths of female wiring so being the only woman on a leadership team can be very challenging. I worked with Julie in three ways. Second, I helped Julie rescript her inner voice to be more intrinsically confident. This is important for almost all women. The woman's brain is far more active than a man's, which creates habits of self-doubt, and second-guessing which must be directly addressed. Ultimately confidence cannot be faked. Under pressure, fear-based emotions will stimulate either withdrawal or blame, which weakens leadership power. Mindfulness exercises designed specifically for leaders helped Beth stay focused on critical issues rather than make herself the issue. 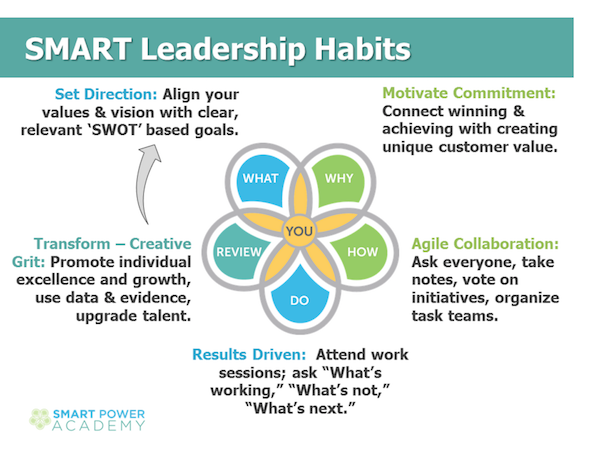 Third, I helped Julie master the 5 Habits of SMART-Power Leaders, which follows the leadership model below. This model is the culmination of a multiyear leadership study I led called "Apple to Zappos" focuses on discovering what today's successful leaders are doing that no one else is. It is based on an in-depth examination of leadership of 21 of today's most successful companies as measured by seven criteria. It also incorporates Hershey and Blanchard's original research on Situational Leadership, as well as Zenger- Folkman's Extraordinary Leader competencies, Teresa Amabile's Progress Principal research, multiple studies on leadership agility and a meta-analysis of gender differences of the human brain. By using the 5 Habits of SMART-Power Leaders, Julie was able to quickly establish herself as a senior strategic leader who was driving business results using her unique capabilities and gifts. She collaborated with her colleagues to help compress innovation to execution times from 36 weeks to 12 and she ensured the innovations that were being developed were highly valued by the company's most prized customers. Most importantly, she was able to accomplish all this by becoming a great woman leader rather than trying to mimic a man. After nine months the company CEO said, "Julie is one of the most successful new executives he had ever recruited." My years of experience of developing and coaching individual women leaders led me to create a program for developing women leaders that is built on a revolutionary design combining men and women working in small groups achieving business critical goals in three months. The results are nothing less than cultural transformation.. And that's essential! In my close work with CEO's, they tell me they need their company culture to be both customer focused and so agile they can quickly shift priorities to respond to constantly disruptive forces. I have found the best and surest way to achieve transformation is to get men and women working together using the new science based tools of SMART Power.